We had an almost pure classic movie experience recently. Well, perhaps not us, exactly, but the woman sitting beside us in the theatre, at the screening of Alfred Hitchcock’s Dial M for Murder. It was, we might add, SHOWN IN 3D. Whee! In the film, Ray Milland plays a former tennis star who discovers his wife (Grace Kelly) is having an affair with an American mystery writer (Robert Cummings). Milland, unwilling to divorce his wife’s money, begins to plan her murder. The most fascinating element of this film, in our view, is that it takes place on a single set – the couple’s London flat. The one overarching dramatic moment is when the would-be murderer (Anthony Dawson) tries to strangle an unsuspecting Kelly while she struggles furiously, fumbling for a pair of scissors with which to fight back. Even though the action takes place on one set, Hitchcock uses clever camera angles to keep us engaged. For example, when Milland demonstrates to Dawson how the killing should be done, Hitchcock mounts the camera high above the set; it feels as though we’re watching a crime via security camera. After Dawson has been unexpectedly killed, Milland straightens the room and manipulates bits of evidence before police arrive. Here, Hitchcock places the camera very close to the floor, as though we’re witnessing this as the dead man might. This film is perfectly cast. Kelly and Cummings are brilliant, and Milland – Great Scott! His lengthy monologue to Dawson, recounting his discovery of Kelly’s affair, is mesmerizing. And when police start to suspect Kelly of cold-blooded murder, the smirky Milland is dazzling as laughs at suggestions that she may be guilty. The police see him as a man defending his wife, but we know he’s delighted that he’s, ahem, getting away with murder. We (as in, yours truly) have seen this film several times, but it took the big screen and 3-D to make us appreciate it in a new way. It also took the reactions of the young woman sitting next to us. She had never seen an Alfred Hitchcock film, and – get this – she had never seen a 3-D movie. One would not have believed it possible in our society. However. Her reactions would have been similar to someone seeing the film when it was newly released 1954. The woman gasped as Kelly drove the scissors into her attacker’s back. She said, “Oh ho!” at various plot twists, and laughed when, at the end of the film, the inspector (John Williams) combs his moustache while phoning Scotland Yard. She provided an almost pure classic movie experience because it was like seeing Dial M for Murder for the first time, as Hitchcock intended it to be seen – in a theatre and in 3D. It was a pleasure to be seated next to someone who expressed nothing but admiration for this remarkable film. Dial M for Murder: Ray Milland, Grace Kelly, Robert Cummings. Directed by Alfred Hitchcock. Written by Frederick Knott. Warner Bros. Pictures, Inc., 1954, Warnercolor, 105 mins. I’m so jealous!! I’m not a fan of 3-D, but I would have loved to see this one as originally released. You make THE perfect case for watching these movies in a theater. While thankful for the fact we have so many available to watch at our leisure, there’s no substitution. I had a blast reading this, Ruth. Thanks, Aurora. Yes, I knew I would love seeing this in a theatre, but didn’t realize how great it would be. It was a big hit with the audience. I’m jealous too! This was one of the classics that got me started so I have special fondness for it (like it needs any extra reason to be special) great post! This was one of the films that started it all for you, Kristina? I’d say you have excellent taste. I’ve never seen a 3D movie either, but I do quite fancy the prospect of seeing Dial M this way. I was spurred by your account into digging out an interesting article on the subject of 3D movies in general that I’d noticed but not gotten around to reading in yesterday’s online issue of Pacific Standard. Thanks for including the link to the 3D movie article. I was surprised to lean that 3D doesn’t have a greater effect on a person than 2D. It surprised me too, because I’d’ve assumed the impact would be greater. Of course, not having seen a 3D movie, I can’t really judge for myself! It wasn’t in 3D, of course, but a few years ago I had the opportunity to see Rear Window in a theater. I was ASTOUNDED at how the (relatively young) audience ate that movie up! It was one of my favorite movie-going experiences ever. It made me so happy to know that a classic film could totally captivate a modern audience. I’m glad to hear that it was a younger audience at your screening of Rear Window, and that they were enthralled with it. Sounds like it would be a really fun evening. That would be SUCH a good movie to see on the big screen! A brilliant picture, one of my favourite Hitchcock films. And what a wonderful experience to go with it. Thanks for sharing. It’s one of my fave Hitchcock films, too! There’s nothing like seeing these classics on the big screen, is there? If you ever trip over a copy of the 1952 TV play/movie that birthed this, then grab it with both hands. the wonderful Elizabeth Sellars is the faithless wife. By the way of these things, I saw the TV version version first (maybe in the late ’50s? ); when I later saw the Hitchcock movie it seemed like a pale copy. Really? Well, I will check it out if I ever come across the 1952 Elizabeth Sellars version. 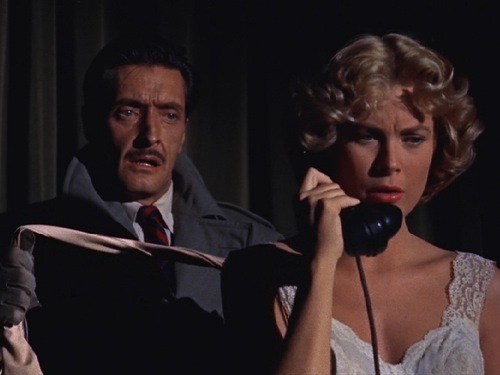 Not having seen it, it’s hard to believe it could be much better than “Dial M for Murder”, but I’m keen to see it. Thanks for the recommendation! Yes, Robert Cummings seemed to have more depth on the big screen but, as you say, no one can hold a candle to Milland and Williams. They are sheer delight to watch. Glad to hear you & hubby got to experience the 3D version too. I wish I could go back & see it again! Fantastic story! Thank you for taking me back to seeing this in 3-D a few years back and loving every minute of it!! I loved how it felt so natural and ungimmicky! 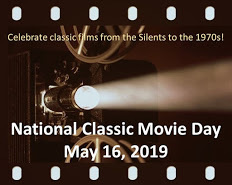 And yes, it’s great to see classic movies with people who’ve never seen them. It helps you re-appreciate (okay now, in my excitement, I’m making up words!) all the fabulous things you’ve seen before. I really enjoyed this, as with all your stories!! Your description of the film as “natural and ungimmcky is so true! I hadn’t thought about it before, but you’re right – Hitchcock didn’t succumb to the temptation of cheap 3D tricks. Marvelous! Loved that you had an authentic audience experience. Love this film – once you start watching, you just can’t stop. It’s true! This film is like a bowl of popcorn…once you start, you cannot stop. My husband and I love Alfred Hitchcock movies. We saw this one a long time ago, and I barely remember it so am going to have to watch it again soon. It must have been so much fun to see it in a theater. I’ve always been fascinated with the way Hitchcock uses different camera angles like you mentioned and also his use of shadows. We just saw another Hitchcock movie, North by Northwest, last weekend. We went to Mount Rushmore this summer so thought it would be fun to watch it again since some of the movie takes place there. Thanks for reminding me about this movie, Ruth! Oh yes, you’ll have to make time to see “Dial M for Murder” again. 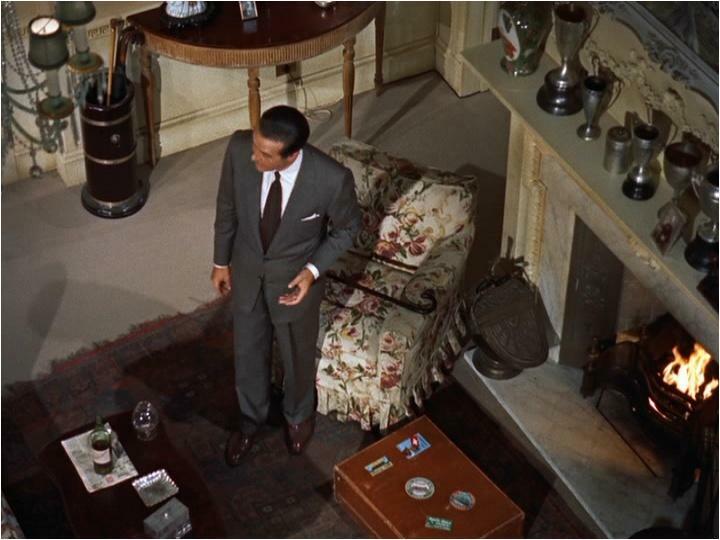 But YOU have just reminded ME that I haven’t seen “North by Northwest” for far too long. Must fix that! You always pick good movies, and then you say the interesting things, and I find lately that I’m compelled to comment on how lovely the main actress in each film is. Grace is really, beside being a splendid deliverer of interesting characters, a wonderful being to look at. In an art-hanging-in-gallery sort of way. Astounding. Ha ha! You’re so right about art-gallery Grace, and she is riveting in this movie, isn’t she? When she’s being framed for murder, her agnst is palpable. How nice to hear a story like this. Too often I hear of younger audiences laughing derisively at revival showings of classic movies. Glad this young lady had some taste and class. Also, did I mention how jealous I am that you got to see this on a big theater screen, and in 3D yet? Grace Kelly in a Hitchcock film just lights up the screen. She certainly does light up the screen. I’ve always been a fan, but I admire her talent even more now. She is perfect in this role. As for the 3-D showing, I couldn’t believe the theatre would actually do that. What a thrill! I have a niece who can’t watch 3D movies either, poor kid. Yes, Grace is amazing and her wardrobe is fabulous, especially that red dress. Thanks for sending the link!